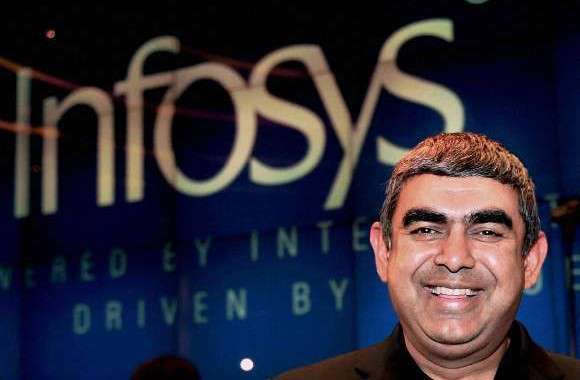 It’s just a few months passed of taking charge at Infosys, India’s second-largest information technology (IT) Services Company, Vishal Sikka, CEO and managing director of the Bengaluru-headquartered company, hit the list of top-50 Highest Rated CEOs in 2015 by Glassdoor. For the first time, an Infosys CEO has made it to this listing, as this is its third year. Dr. Sikka was born in Shajapur Madhya Pradesh, his father is an officer in the Indian Railways and his mother is a teacher. At the age of six, his family moved to Vadodara which is situated in Gujarat. Vishal Sikka joined the bachelors in computer engineering course at Maharaja Sayajirao University of Baroda, which he discontinued to go and managed to travel Syracuse University in New York where he was rewarded a B.S. in computer science. His thesis was labeled Integrating Specialized Procedures into Proof Systems. in 1996 he got graduated with his Ph.D. After a short session at Xerox’s research labs, Sikka founded iBrain which competed at the time with Business Objects. His second startup, Bodha.com, particularly focused on developing technology for non-invasive, service-based integration of enterprise applications and information. Sikka then joined Peregrine Systems as their area Vice-President for Platform Technologies, he was responsible for application development and integration technologies and architecture, following their collection of Bodha.com. On 12 June 2014 Dr Sikka appointed as Chief Executive Officer and Managing Director at Infosys and on 1 August, took over charge from S.D. Shibulal, one of the founders. On 14 June, He was introduced as a full-time director of the Board and CEO & MD of Infosys.